In France, a common notion is that the shared interests of graduate students and their professors could lead to intimate sexual relations, and that regulations curtailing those relationships would be both futile and counterproductive. 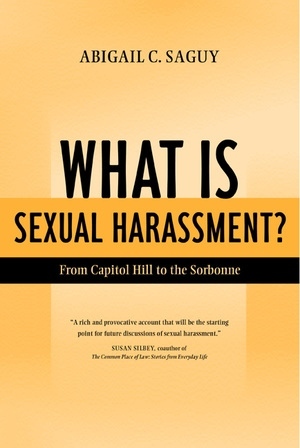 By contrast, many universities and corporations in the United States prohibit sexual relationships across hierarchical lines and sometimes among coworkers, arguing that these liaisons should have no place in the workplace. In this age of globalization, how do cultural and legal nuances translate? And when they differ, how are their subtleties and complexities understood? In comparing how sexual harassment—a concept that first emerged in 1975—has been defined differently in France and the United States, Abigail Saguy explores not only the social problem of sexual harassment but also the broader cultural concerns of cross-national differences and similarities. Abigail C. Saguy is Assistant Professor of Sociology at the University of California, Los Angeles. 3. Sexual Harassment in the Press: National Scandal, Pride, or Superiority?